Do you need a workable solution for your construction storage and office needs? 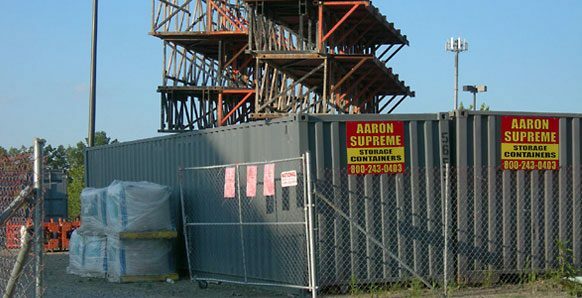 Here at Aaron Supreme, we specialize in renting and selling high-security storage containers and trailers for a variety of industries, including construction. We can deliver your container to the location of your choice, from construction sites to real estate development sites. Proudly serving Connecticut, Massachusetts, Rhode Island, and New York since 1964, we offer clients commercial and home storage containers. As a foreman, builder or construction site owner, you understandably need secure places to store your construction equipment and supplies when not in use. You may also need a temporary office from which to conduct meetings, direct employees and generally serve as a home base for all operations. That’s where our construction storage and office solutions come in. Our containers can be customized to enhance your specific needs. From locks to shelves, we offer accessories and security products to modify your containers for easier use and greater security.